Imagine a day off from work during the peak of the whitetail rut and you’re just too sick to hunt. It’s like being on a diet with the sweet temptation of freshly baked chocolate chip cookies caressing your nose, but knowing that you just shouldn’t. That’s how Kevin Harris was feeling on the morning of November 10, 2008. He spent the restless early morning hours nursing his cough and staring out the window, thinking about the rutting bucks that were likely cruising by his stand. “If only this nagging cough would let up,” he thought. Harris had taken the day off to hunt a new property where he had seen a good 8 point a few weeks earlier. 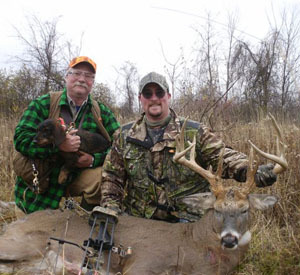 Kevin Harris is somewhat of a late bloomer with bow hunting. He hails from Oswego, NY where his family loved to fish and play ice hockey, but never thought much about bow hunting. It was his father in law, the late George Good, who showed him the way of the stick and string, which soon got in his blood. By late morning he could take it no more. Cough or no cough, he was going to hunt. Pushing through the fog of his cold, he hit the new woodlot with his Lone Wolf climber strapped to his back and two grunt calls around his neck. Harris excitedly told Armstrong the roller-coaster story of his eventful day in the field. By 11:00 a.m. he was standing at the edge of his new hunting property considering his options. Knowing the rut was well underway, he decided to tow a drag line laced with tarsal and estrous scent through the woodlot of maple, ash, and cherry timber to an inside corner where a standing corn field met the forest. He liked the set up, but within 20 minutes of getting settled, he was already second guessing his decision to climb up in a tree. He simply couldn’t suppress his coughing, causing him to lose confidence in remaining hidden from nearby deer. Making matters worse, it was one of those damp fall days when the forest floor is like an acoustic sponge, absorbing every footfall that might alert an attentive hunter to a buck’s approach. On this day, not even the usually obnoxious rustling of a gray squirrel’s frantic winter preparations could be heard. He continued to walk toward the source of the grunts without coming broadside. More than an hour’s drive to the north near Canadaigua, NY, Armstrong was sitting at his kitchen table holding the phone tightly. Harris now had his full attention. This is the part of a hunter’s story that Armstrong needs to hear because it tells him what he needs to know about the possibility of recovering the animal. A million thoughts raced through Harris’s head. “Stay calm. Don’t cough! Don’t look at his head. Just pick a spot and put the arrow there.” Finally after a bee-line walk, the buck slowed to a stop and turned to his left at a distance of 25 yards. Again the thoughts raced. “He’s still slightly quartering to me. But he’s in a shooting lane. Big bucks don’t make mistakes like this more than once.” Harris, already at full draw, settled the pin just behind the shoulder and released. The stricken buck hunched his back high like a Halloween cat and lurched forward a few steps. Armstrong’s mind methodically logged the details for future analysis. Even through the phone he could hear Harris’s voice tighten. Armstrong wanted to ask questions, but he knew the best thing was to listen to Harris’s uninterrupted story. He would probe for new details later. “I could see my arrow sticking from the ground where the buck had stood and I knew I hadn’t missed,” said Harris. I had maybe 10 seconds for a follow up shot as the buck paused, but I was too dazed to act.” The great buck walked off, hunching his back every few steps until he disappeared from view. Listening to this part of the story, Armstrong’s face involuntarily contorted into a grimace. He knew what the hunched back meant, but he bit his tongue and let Harris continue. Harris may be (relatively new to the ways of the stick and the string,) but he is an astute hunter who knew that mortally wounded deer usually take off like greased lightning. He knew something wasn’t right. Easing down the tree on still shaky legs, Harris slipped toward the shot site. The arrow protruding from the wet ground glistened with a red varnish of blood from stem to stern. The corners of Harris’s mouth pointed upward and his spirits brightened. On the other end of the phone, Armstrong too was encouraged by this development, but only remained cautiously optimistic given the buck’s telltale hunched posture. In his mind, Armstrong hoped that Harris would next tell him how he turned around and silently walked back to his truck to give the paunch-shot buck some time. And, that is exactly what Harris had done. But, was it enough time? After driving around with a cocktail of emotions surging through his soul, Harris arrived back at the shot site three hours later. Armed with a roll of orange flagging, he studied and marked the spoor. At first, silver dollar-sized splotches of blood guided his forward movement. Within 100 yards; however, the dollars diminished to dimes and he struggled to stay on point. Then he saw it: a large, fresh bed with a smear of blood at its center. Encouraged, and with new blood to follow, Harris continued but soon the tiny red droplets gave out again. He circled ahead of his flagged trail, but lost the big buck’s tracks in a confusing maze of deer trails. It was getting dark and time to pick up his daughter from school. For the second time, he retraced his steps to the truck. Most of us have been there. Harris was waging war with himself, second guessing his every decision and wishing, in some weird way, that he had never laid eyes on the giant buck. Back at home he nervously babbled to his wife and considered his options…none of them seemed reasonable. Then he remembered an advertisement he had seen in the New York hunting regulations manual and picked up the phone to call DeerSearch. Karma lined out on Harris’s orange flagging and moved ahead with confidence. Small but eager, she knew her job and took little instruction from her master. Karma’s breeding and Armstrong’s training had prepared all her senses for the task. Even after reaching the point where no blood was visible, Karma continued to sort out the stricken buck’s path from those of myriad other deer. Along for the ride were tracker Ron Betts and four month old Effie, also a wirehaired dachshund. Following young Effie’s tentative lead, Betts broke off in a different direction, while Armstrong and Harris followed Karma’s convictions. After several hundred yards with Karma guiding the way, the trio came to a goldenrod field where Karma seemed to lose a clear sense of direction. Her excited behavior; however, told Armstrong that the buck was nearby. Armstrong instructed Harris to follow an ATV trail along the edge of the field and “be ready,” he said. Flanking Harris, Armstrong and Karma tentatively crept through the tall, thick goldenrod, but no degree of anticipation could have prepared them for the burst of insanity that ensued when the 220 pound buck sprang into view, struggling to gain its legs and flee their approach. Fearing a bit for he and Karma’s safety, Armstrong reeled in the dog’s check cord and withdrew his .44 from its holster while calling for Harris to come quickly. In a near frenzy, Harris desperately ran toward the flailing buck while trying to nock an arrow. At just 30 yards, he could see the buck’s rack thrashing above the dried goldenrod stalks, but he had no shot through the dense vegetation. Not knowing whether Harris could reach the buck in time, Armstrong raised his handgun and shouted, “Kevin he is trying to get up. Should I shoot? “Yes!” came the reply. Two sharp, successive cracks split the silence and it was over. The great buck lay in his final resting place. Before the last echoes could be heard, the air was already ripe with emotion—relief, gratefulness, joy, and the paradoxical remorse that comes uninvited to every successful hunt. Gaining their composure, the men shook hands and agreed that the right thing had been done. Karma proudly sat near the buck’s outsized head, where she received well-deserved praise. Hearing the shots, Betts and Effie rejoined the group and reported that they too had found a buck—a forkhorn that apparently another hunter had lost. Harris firmly believes his late father in law, George Good, played some kind of divine role from the heaven’s in helping guide him to the recovery of this buck. He had unexpectedly passed away on Christmas Eve morning in 2007. It was a feeling that no one can imagine other than the person who is experiencing it. According to Harris, “he was willing me to find that buck, and with the help of Kevin Armstrong and his faithful companion Karma, we did just that. I said a prayer of thanks over the animal in my father in law’s name. It was surreal.” That indescribable feeling helped cement the given name to the animal as the “Good Karma” buck. 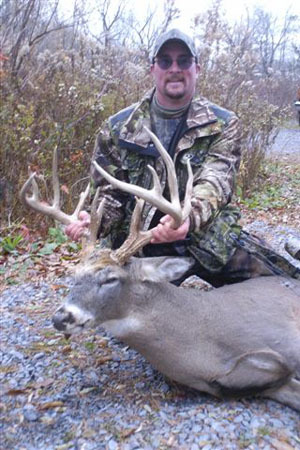 Kevin Harris’s buck raised a number of debates in the whitetail hunting community. Chief among them were the use of dogs and firearms to recover a bowshot animal. In Europe there is a long history of dogs being used to hunt and recover big game. Hunters and state agencies in the U.S.; however, have been slow to accept dogs as a legitimate means of recovering animals. To date, only 15 states permit the use of tracking dogs. The resistance is primarily due to concern that dogs will be misused to drive deer to hunters, but there are other issues related to record keeping. The official gross score of Kevin Harris’s buck is 167 2/8 inches. That’s a trophy in any state and even more remarkable for New York. The New York State Big Buck Club grappled with not having an official policy on the books to deal with the manner of taking for Harris’s deer. There was question of if or how they should recognize this deer for the record books. In the end, based on much discussion and analyzing the specifics of this individual situation, the NYSBBC accepted the Harris buck into their record book as a bow kill. These circumstances likely portend future conundrums about the use of dogs to recover game animals and the eligibility of those animals in record books. The prompt use of tracking dogs will increase the number of deer recovered in a timely way; however, using dogs long after humans have failed might result in deer that are recovered many days after the shot. Should these deer be eligible for entry into record books? It would behoove record keeping organizations to consider these issues and amend their policies to reflect what the majority of their membership votes on regarding this matter. Some characterized the recovery of the Harris buck as unethical. I suppose that’s one opinion. In my view, it boils down to this. As bowhunters, our foremost responsibility is to first make clean, humane kills and second to exhaust every legal option in recovering a wounded animal. The two Kevins did just that. Harris made the wise move to call DeerSearch and Armstrong made the right decision to quickly end the life of a wounded animal. These men weren’t thinking about whether this deer would qualify for record books. They were acting as ethical hunters who felt an intense responsibility to their quarry and themselves. We should be proud to have them in our ranks.